When selecting a treadmill you may have top-speed requirements if you are training for a race or are a fast runner. A faster treadmill may give you increased training options such as during intervals when you speed up for a short amount of time before returning to a comfortable pace. While shopping, factor in the cost of the treadmill versus your running goals. Most at-home treadmills have an average top speed of 10 mph. You would select this speed if you are able to run at a six-minute-mile pace. You could also use the top speed in short intervals followed by a slower pace to improve your running. Most at-home treadmills are powered by DC motors, so they are quiet enough that you will be able to hear your television or listen to music during your workout. When using a home treadmill, especially at top speed, wear the safety clip so the treadmill shuts down if you fall or trip. 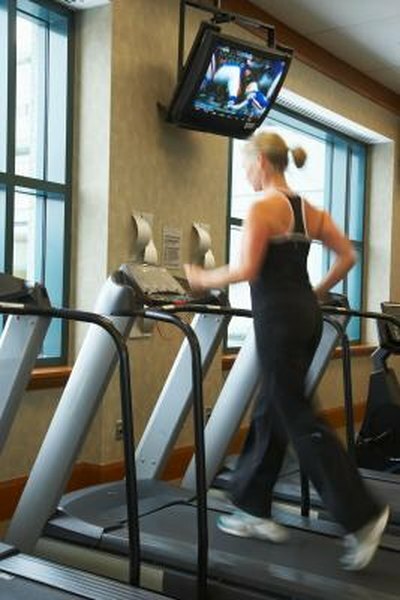 Treadmills for use at health clubs have a maximum speed of about 15.6 mph. If you run a 3.8-minute mile, you would be able to run at maximum speed, but check with gym management before setting the machine to maximum as there may be liability issues they'll want to address. The horsepower on most commercial treadmills is between 3 and 6. An AC motor usually powers a commercial treadmill as these machines are used many hours throughout the day. Treadmills are often used in cardiac and physical rehabilitation settings. High maximum speeds are not required in these settings, as patients are walking for recovery purposes, not training for long races or speed. Most rehabilitation treadmills have top speeds of about 12 mph. When selecting a treadmill, look for one with a higher horsepower, if you typically run at high speeds. A higher horsepower will provide better performance at top speeds. Treadmills are available in AC-driven, alternating-current, or DC-driven, direct current, motors. AC motors are usually used in commercial treadmills and require more power to run than DC motors. DC motors have fewer parts and are quieter to run.